The annual Awards ceremony was held on the 14th May. 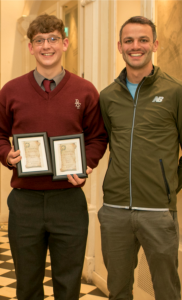 Thomas Barr past pupil gave the keynote address. Thomas is a very accomplished athlete. Thomas won gold in the 400 metres hurdles at the 2015 World University Games in South Korea with a time of 48.78 seconds. In April 2015, Thomas was named the European Athlete of the Month for, in part, being part of a national relay record and having a world-best time in the 400 metre hurdles. On 15 August at the 2016 Summer Olympics, Thomas finished second in his heat of the 400m hurdles. The following day he broke the Irish record and won his semi-final to qualify for the final in a time of 48.39. He finished fourth in the final. Chaplain’s Award, Community Spirit Award, Lasallian Award, Senior Debating, Green Schools, Student Council Award, Construction Studies and Technology Wood best project awards. Specialist awards include Year Head Award, Principal’s Award, the Lesley Leahy Award in memory of our former beloved colleague Lesley. For the first time a special Music Bursary was presented on the night. 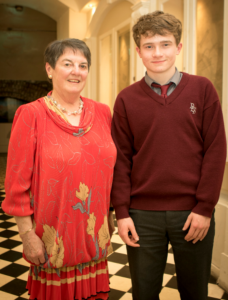 Oran Kelly with Brid Mulhearn who presented him with a Music Bursary. 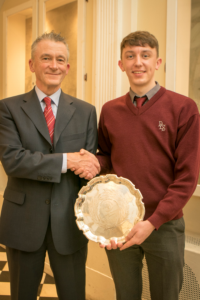 David O’Hare with Thomas Barr Winner of the ‘Principal’s Award’.